How to set the position where they exit the printer page with these easy steps. Some HP printers have the factory configuration that when printing out the last page of the document, we are used to print the document and output the first page, i try to say page No. 1 and then the other pages. It is a term that could be called printing in ascending order, to change the mode or otherwise our put printer to print in this way, need a little knowledge of computer, and at least be able to identify which operating system used. The process varies depending on which system is installed in our computer. A little computer knowledge is necessary because we have to navigate the printer properties to locate the tab that will allow us to configure we want. We must go to printer devices, start menu located on our computer and the right of the menu options appear in which you should select Printers and Faxes if you're using Windows XP or printer devices if using Windows 7 or more. When you get where you are the printer is the printer icon printer devices, right click and click Printing Preferences, depending on what our preference posters operating system, Windows XP will appear in the last position and Windows 7 or more rollin 'in the fourth position from top to down bottom. 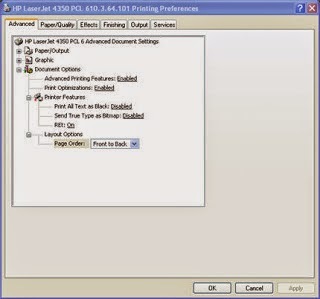 The dialog box printing preferences that we will have to click Advanced in case this what you have, do not have it click Printing Preferences menu within the next printing preferences to print a test page. After this configuration click on the bottom right where it says save, print the documentation you consider, if the problem persists please contact us, we will gladly help you.